Why does Spider-Man (Sam Raimi version) not start out his career wanted for murder? 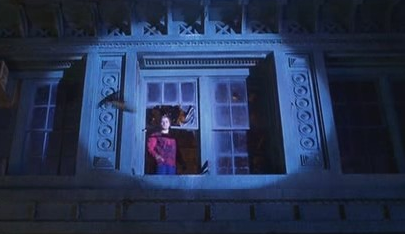 In the first Spider-Man movie, when Peter tracks the thief who killed his uncle to the warehouse and confronts him, the thief stumbles backwards, trips over a raised pipe on the floor, and falls out of an upper-story window to his death. Peter then steps up to the window to look out. To an outside observer who didn't see the pipe, it looked exactly like Peter had just pushed him, and the "outside observer" is not hypothetical in this case: there were cops nearby with a searchlight. They turned it and got a good, solid look at the "murderer" in the window, and he was wearing the Spider-Man costume. I remember the first time I saw the movie, thinking "oh no, now he's going to start his career out wanted for the murder of that thug," ...and then nothing ever comes of it. No police want to find Spider-Man or take him in for killing the thief, despite what looks like a clear set-up to have this as a plot point. Did anyone involved in the making of the film ever talk about that? Even if they did spot that spider symbol and made the connection later when he became famous, there's really not enough evidence to tie this back to Spiderman and could be ruled as a coincidence. Not the answer you're looking for? Browse other questions tagged plot-explanation spider-man-trilogy . Why was Bruce Campbell in all three Spider-Man movies? Why isn't the killer of Uncle Ben killed by Spider man in The Amazing Spider Man? How does Doc Ock stay awake after being punched by Spider-Man? Why was Patrick not arrested for his murder? Are any of Peter Parker's early costume designs allusions to the comic books? What does Peter Parker want in Spider-Man 2 (2004)? In Spider-Man 3, why does MJ lie?